and Winter is always followed by Spring. surrounded by the Promise of Spring with buds barely swelling. Yes, Patience is required but there is only one and a half months left of winter!! And, as my vice principal emailed all of us teachers today, "there are only four months left of school." GAHHHH! Unbelievable! A lot of promising things under the blanket of snow. It will reward you with many things for your patience. Come spring, sleeping beauties will be awaken. I'm glad you stopped by. Asparagus fern really does look great in a planter, whether alone or as a filler. I enjoyed your post today. Yes, it takes an inordinate amount of patience every year. But we do know spring always follows winter, even if sometimes it is disguised as winter or summer. (We've had springs like both!). Looking forward to green grass and buds on the trees. My son tells me that in Vancouver the tulips and daffodils are coming up and the buds on the trees are swelling. Already! That's zone 8 though. Fabulous photo of the tree bud and clinging leaf. I enjoy the beauty of trees in winter. 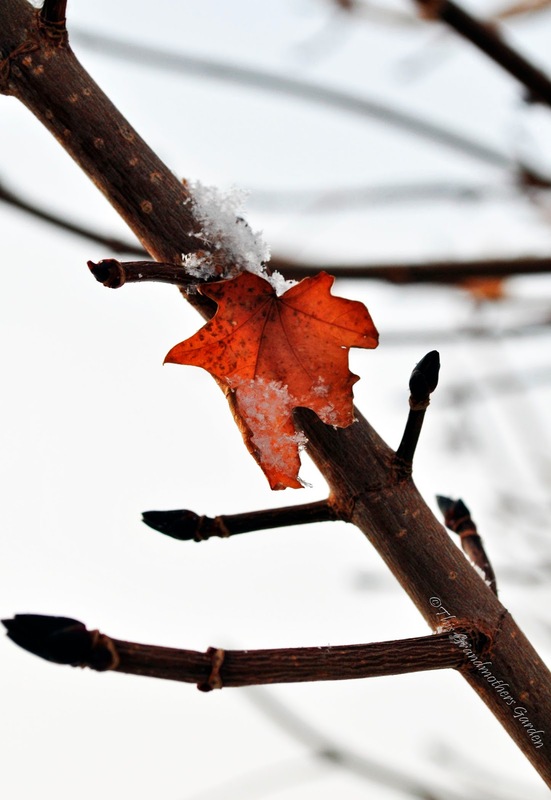 Some experts believe that the clinging leaves may protect the overwintering buds on the trees. Its a natural condition called marescence, when deciduous trees hold onto their leaves. The oak trees in our neighborhood hold onto their leaves through winter. What a poignant reminder of the seasons. You always amaze me with your beautiful photography and your writing. Lovely! Mother nature winter design - love it and also the chairs you have I would like to have them too. I do not want to be patience any more I want it to be spring now! A beautiful photograph illustrating a very timely reminder. Gardeners should surely be more in step with the seasons than most? Yet we tend to want the winter to speed by, despite its much needed role in our 4 season gardens. You have truly united three seasons in one photo - great. It's a lovely photo and certainly worth a post of its own. Blotanical forums! I visited once when they started, got lost in threads and never returned! I'm impressed how many things you have on your blog page. It's amazing how you've made it seem much bigger than it is. I have great trouble fitting things in! Such a lovely photo and sentiments. Oh, how perfect! Patience Required. I think that would make a delightful garden stepping stone. I have visited here several times but rarely comment on poetry. Well stated, patience and everything will be peachy before we know it (sorry about the 10 degrees there). Thanks for commenting on my blog, hope you are well soon. Just went to the recycling center, still not feeling up to power yet. Patience is required in every aspect of gardening isn't it? A virtue, really.